Tsokye Tuktik, with Guru Tsokyé Dorje as the central figure, Orgyen Menla on bottom left, Dorje Drolö on bottom middle and Khandro Norlha on bottom right. Tsokye Tuktik (Wyl. zab lam mtsho skyes thugs thig las: ma ha gu ru phyi ltar o rgyan sman gyi bla mar sgrub pa) 'Heart Essence of the Lake-Born Vajra, the Secret Accomplishment of the Great Guru' is a mind terma of Dudjom Rinpoche focused on Guru Rinpoche in the form of Guru Tsokyé Dorje, which was revealed in 1929. It is the main lama practice in the Dudjom Tersar lineage, and one of the four main terma cycles of Dudjom Rinpoche. The Tsokye Tuktik is a lama practice focused on Guru Rinpoche. 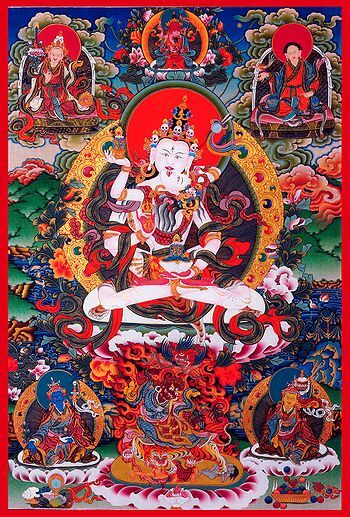 The outer form of the lama is Orgyen Menla Dütsi Bum Zang, the inner form is Lama Orgyen Khandro Norlha, the secret form is Tsokye Tuktik (Lake-Born Vajra) and the innermost form is Dorje Drolö.